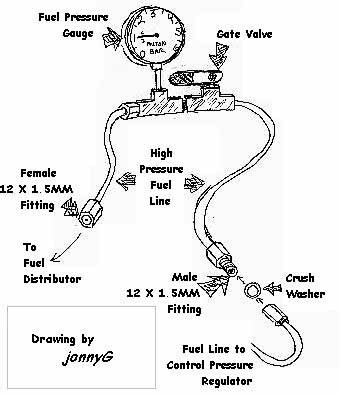 You can't effectively test fuel pressure without a fuel pressure gauge. Otherwise, troubleshooting is guesswork. Making and using the gauge is very easy. There is no excuse NOT to test your fuel pressure when experiencing problems with your car such as cold starting, hot starting, rough idle, stalling, won't start, etc. The ONLY hang up you may have with making this contraption is finding the METRIC fittings (12MM diameter with 1.5 thread). We get ours from M & W Hydraulics here in Tampa. It may take some creative CIS scrapping to get the fittings together that you need, but you'll get it together! I'm sure. I've got faith in you! Your fuel gauge will have a 12MM X 1.5 female fitting on one end. This will screw into the fuel distributor at the point where the fuel line that goes off to the control pressure regulator is currently screwed in. You will need the fitting to be attached to a fuel line that will withstand high pressure (80PSI+). The other end of this fuel line is then fitted to a T fitting. Off of one of the fittings on the T, you will screw in a pressure gauge. The remaining fitting on the T will lead off to a gate valve. The gate valve will then lead off with another piece of fuel line that will then have a male 12MM X 1.5 fitting on it that the car's fuel line going to the control pressure regulator will screw onto. 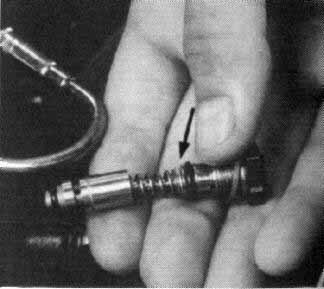 Once you have this miracle-in-fittings-gizmo assembled, you will then need to disconnect the line off of the top center of the fuel distributor. It's the line with the big steel U bend in it. Screw on your pressure gauge's female fitting. Take the line that you removed from the fuel distributor and screw it onto the other end of your fuel pressure gauge contraption. The gate valve will reside between the fuel pressure gauge and the control pressure regulator. You will now need to make a jumper wire for your fuel pump so it'll run without running the engine. Get a two inch section of wire and put a male spade connector on either end. OR....NAPA sells these inline fuse holders with the wire attached, so if you want, you can take one of these and put your male spades on either end of it and a 8-10 Amp fuse in the middle. The place to "hot wire" your fuel pump is on your relay panel. There's a big ol' relay there in a socket labeled "L". On newer models, it's blatantly labeled "FUEL PUMP". The place to stick the wire is the topmost vertical receptacle (labeled "13") and the lower most horizontal receptacle (labeled "14"). Doing this will energize your fuel pump. Once you have your gauge hooked up and the fuel pump energized......let's figure out how to read this sucker! How did I get these readings? For system pressure, one merely needs to have the fuel system energized with the valve CLOSED. This is your systems pressure (without regulation by CPR). For control pressure, open the valve. If the car is off and has been sitting for a while, you should get the "cold" reading above (the above figures can be off by ±1 or 2 PSI). To test warm control pressure, I'll turn the car on and let it run (valve open, fuel pump relay back in). If your pressure gauge aperture is gütentight (german for snug), then the bunny shouldn't even notice that it's under surveillance. Go inside and have a Grolsch. When your car's temp gauge is pegged dead center and the fan is whirring away, and you're finished with the beer, shut the engine off and check the gauge. Residual pressure is when you now take that gauge, flip the valve closed and watch the pressure drop. The pressure should drop SLOWLY and should be no less than 1 BAR after a minute has gone by. Now you're saying, "What if these readings don't match mine??" You're screwed. Buy a new car. NO! Just kidding! Let's look at the possible causes. System Pressure High or Low: Always check the fuel pump and fuel filter if the system pressure is too low. If the fuel pump is known to be good and the pressure is too high or low, pressure can be raised and lowered by adding or removing shims just below the o-ring, just above the spring in the system pressure regulator (SPR). The system pressure regulator is the "bolt head" that protrudes out from the back side of the fuel distributor (opposite side of the flow plate). When you replace the pressure regulator back into the distributor, go ahead and replace the o-ring and crush washer too. If anybody knows of any reasons why system pressure would be high or low and has solutions please e-mail me. Control Pressure to High when Cold: This is not good because, the high fuel pressure is opening the valve of the system pressure regulator and returning needed fuel to the tank. why would this happen? Lots of times the control pressure regulator (CPR) is clogged with fuel contaminants, or the lines going to or from the CPR are clogged. If this happens, the pressure never gets THROUGH the CPR and backs up to the SPR, thus causing it to open prematurely, leaning out your car when it needs extra fuel the most. Try cleaning out the CPR (you'll have to open it up) located just next to the oil filter housing. Unbolt the fuel lines attached to it, and unbolt the two 5MM hexes holding it to the block. Flip it around and unscrew the four flat head screws. Remove the guts and unscrew the four tiny screws inside. This will expose the little fuel screen to you from the inside of the CPR. Blow out or blast with cleaner. Also, blow out the lines too (PLEASE remove from car first!). Control pressure still too high? Replace CPR with junkyard variety and test again. If anybody knows of any other reason why control pressure would be high when cold please e-mail me. Control Pressure to Low when Warm (Did not gradually rise): Now your car is running too rich. It's like the choke is on 24/7. This is usually caused by the RETURN line (or an adjacent fitting) being clogged so not enough fuel goes back to the tank. Instead, the fuel is sent to the injectors which are now squirting full blast. Blow out this line and retest. If anybody knows of any other reason why control pressure would be low when warm please e-mail me. Of course, ANY of these results can be effected by a funky fuel pump (please check fuel pump) or whacked out fuel distributor. If you're replacing the fuel distributor, make sure you get the plunger (the thingy in the center) and the SPR with it. These are made to EXTREME tolerances and ARE NOT interchangeable. Residual Pressure Drops Too Quickly: This one is the easiest to cure. You have a fuel leak. It is more than likely an injector that is stuck open. Pull out your injectors (include cold start injector), stick them in Corona bottles (or other clear bottle) and energize the pump. They should stop dead when the pump shuts off. If one does not, there is your culprit. This is also a good opportunity to check the spray patterns of your injectors too. You want a steady conical shaped spray (nicely atomized) not a trickle. If the injectors look good, the leak may be coming from a worn out crush washer or ruptured line or fitting. Check for "wet spots" in the underhood fuel system.